The risk of delivering newborn with overweight (9 pounds or more). High amounts of glucose in the circulation can cross the placenta, triggering the baby’s pancreas to produce more extra insulin. As a result, the baby can gain more pounds of weight and grow too large. Premature birth. Poorly-controlled gestational diabetes may make you give birth too early. Or if the baby has become too large, your doctor may also ask you to choose early delivery. The risk of having baby with respiratory distress syndrome, difficulty breathing problem. It is likely to occur in baby with premature birth. The risk of mothers with gestational diabetes to have babies with respiratory distress syndrome is still pretty high even though if they give birth normally (not premature). Babies may also have a hypoglycemia (low blood sugar) shortly after birth due to the high amount of insulin produced by their own pancreas during pregnancy. Gestational diabetes is not the end of everything. With careful monitoring and treatment, you can still have a safe & healthy pregnancy. Do eat carbohydrates, but it’s much better to chose healthy ones. 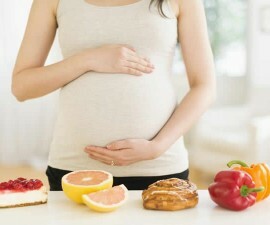 No matter with or without gestational diabetes, your body always needs glucose. It is the main fuel of where your energy coming from. Just make sure to eat a wide variety of complex carbohydrates, typically high in fiber and with low GI (glycemix index) such as whole grain, sweet potatoes, and brown rice (whole grain rice). See also good and bad foods for your blood sugar in this section! Do eat everything in balance! Even healthy foods also have calories. So make everything fit into your daily calories! If necessary, see a registered dietitian for more assistance. Being pregnant doesn’t mean you can forget your exercise. Even regular exercise is very important for your pregnancy, especially true if you also have gestational diabetes. It can help improve your overall health, keep your weight under control, and good for glucose metabolism. 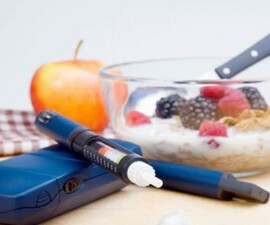 Do keep monitoring your blood sugar levels! Your doctor usually ask you to check it at certain times, typically after fasting (in the morning, before eating anything) and 1-2 hours after meal. If you take insulin, you may also need to check it at bedtime and before exercise. See more the normal blood sugar targets for diabetics in here! Sleep well! Research suggests that lack of sleep may make you more difficult to control your blood sugar. Unfortunately, it’s not always easy to sleep well in the late pregnancy. If you do have difficulty sleeping, talk to your doctor! In many cases, lifestyle measures such as eating right and exercising are helpful enough to control the condition. However sometimes diabetic medication is required. If you need medication to control your blood sugar, take it as well as prescribed! Avoid foods that are easy to cause a spike in blood sugar such as sugar-sweetened drinks, too sweet tea, or any drinks added sugar. Bad source for protein such as pork bacon, fried meats, ribs, poultry skin, deep-fried tofu, and deep-fried fish. Bad source for carbohydrate (simple carbohydrate) such as any processed grains (white flour or white rice), cereals high in sugar and low in fiber, white bread, and French fries. Bad dietary fruits and veggies such as canned fruit, canned vegetables, fruit punch, sweetened applesauce, – and veggies cooked /added with lots of cheese, sugar, sauce, or butter! Bad dairy products such as regular sour cream, regular yogurt, regular ice cream, and whole milk. It’s more recommended to choose low-fat dairy products such as low-fat yogurt, skim milk, and low-fat sour cream. Bad dietary fats such as any foods high in saturated fats or/and artificial trans-fat! To keep safe – make sure that most of your dietary fats is loaded with healthy fats, unsaturated fats such as nuts, avocados, fatty fish (like salmon and tuna), and plant-based oils (like olive and canola oils). It’s normal to gain weight during pregnancy. But it’s also important that your pregnancy weight gain doesn’t go too far. If you had BMI (body mass index) greater than 27 before pregnancy, your doctor may ask you to lower the amount of calories in your diet – talk with your doctor for more assistance! You may also need to take extra prenatal appointments to make sure that it is always controlled as well over the course of the pregnancy. This is important to prevent the complications of the disease. As long as your blood sugar is controlled as well, the result of ultrasound scan is normal, and you have no problem with pregnancy, you can wait for delivery (labor) to start naturally. Normally, the chance to start labor is usually offered after 38 weeks pregnant. But if your baby is large for its age, or if there is something goes awry on ultrasound scans, or if you have particular problem in your pregnancy – your doctor may recommend taking early birth. Can Gestational Diabetes Go Away Before Delivery? When to Start Insulin in Gestational Diabetes? Can Exercise Reverse Gestational Diabetes?